to capture in stereo mix mode any sound playing on a multiplex audio card. For the best audio quality, you must setup the record mode of the audio card in "stereo mix", and disable the microphone. 2 - Start playing a movie (with a sound track) or a local or internet audio file (streaming). 3 - Press the [Start capture] button, to see the oscilloscope PCM WIMDATA curve. 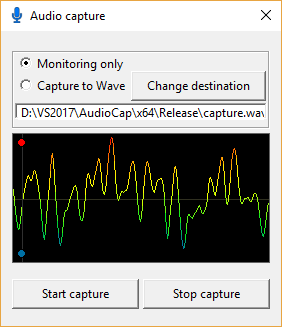 4 - Check "Capture to Wave" if you want to create the "capture.wav", or check "Monitoring only" if you want to see only the peak level.